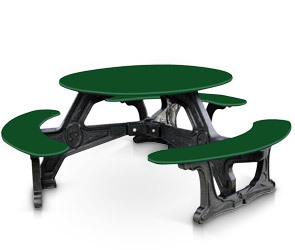 This recycled plastic picnic table comfortably seats six for dining in any outdoor environment. The round shape makes it easy to socialize with anyone at the table, and the curved benches contour to the table for easy table top access. The recycled plastic frame features intricate designs that give this table a classically elegant feel. Table frame comes in standard black while the table top and seats are available in any of the color options shown below. All plastic used is made from recyclable materials, and secured with stainless steel hardware. Table top diameter is 45-3/4" and overall footprint is 77-1/2"